The Spiraling Worm, a collection of connected Cthulhu-mythos short stories by David Conyers and John Sunseri, has a rating of 4.5 stars on amazon.com. For the life of me, I don't know why. I bought it, and I did actually read the whole thing, but I'm now kind of wishing I'd just given up, for two reasons. The book made a good first impression. That cover looks like a role-playing game box from 1982. Brilliant. To me, it said "don't expect Great Literature, but this'll be a lot of fun". But then I started reading, and started seeing the mistakes. Oh, God, the mistakes. The whole of The Spiraling Worm reads as if the authors took their first speedy drafts, ran spellcheck over them taking the first recommendation every time, and sent the result off to be printed. In dashed-off e-mails or, I must say preemptively, a blog post, one may be forgiven for dropping a few clangers. Doing it all the bleeding time in something printed and bound is less forgivable. I can't say I wasn't warned, in the first few pages. It's not a good sign when, in the introduction to a book, someone who's supposed to be a professional writer misuses the word "literally" (apparently Lovecraft "literally blew the doors off..." a genre). Perhaps I'm being excessively peevish about the inexorably shifting meaning of "literally", but the book also contains more than one use of the words "discreet" and "discreetly", and every damn time they spell it "discrete". These guys also do not miss a chance to say something "teamed with life" when they mean "teemed". I've spent too long proofreading my own and other peoples' writing to be able to ignore these sorts of silly errors, but I can entirely forgive them when the story is good. Take the excellent comic series Powers, for instance. It has marvellously real-sounding dialogue that manages to avoid covering the whole page with speech balloons, so it's no big deal that that dialogue has spelling and punctuation errors well beyond those you can charitably ascribe to deliberate realism, as when someone refers to a "mulantov cocktail". Returning to books with no pictures, Richard Kadrey's Sandman Slim is a fantastic yarn, but the hardcover edition I've got has a lot more errors than I'm used to seeing in a professionally-produced book. It's usually single-character mistakes - there's an "old school king fu fight" on page 100, for instance. But more unsettlingly, on page 191 a major character leaves to go and get lunch, then 40 seconds of dialogue later rematerialises to deliver one line. This is the sort of thing that could actually happen in the Sandman Slim universe, but it wasn't meant to. Getting back to The Spiraling Worm, the whole damn book's full of grammatical messes which, like dangling modifiers, bring your reading to a halt while you attempt to determine what the authors were trying to say. The authors at one point mean to say "under the metal roof" or "under the tin roof" or maybe even "inside the tin shed". They get a bit confused and it comes out "under the metal tin". And how about "...the assassin slipped back into the spaces between the old walls from where he came, pulled back the painting which covered his exit hole he had cut to gain entry, and disappeared"? I've got a better one. "If anyone can find a loophole that's even more than extremely obvious to why we shouldn't keep this thing alive, it's going to be you." In a story in which two human bodies have turned to liquid at a touch, which is the sort of thing you can jolly well expect to happen if you start hanging around Lovecraftian beasties, we encounter "the crumbled body of a sentry". Except that body's only meant to be "crumpled". It don't half knock you out of the plot while you figure that out. Oh, and someone else in that story is neither crumpled nor crumbled, but does suffer a dislocated nose. I'm pretty sure that's not a real thing. And the authors apparently think the C-130 Hercules is a helicopter, which given that there's another helicopter in the same story is very confusing. They successfully describe the aircraft as a "C-130 Hercules transport" early on, but then it mutates into a "bomber helicopter". My main complaint about the actual stories in The Spiraling Worm is that they're far too upbeat. Humans, without superpowers or the protection of a deity, keep somehow having a chance against unnamable Lovecraftian abominations. The series of stories has more than one protagonist who survives more or less undamaged from beginning to end. This is, to some extent, a refreshing change from the classic Lovecraftian protagonist who, at the end of the story, goes out still scribbling down his impressions of the sound being made by the Thing coming up the stairs to do something much, much worse than eat him alive. But I still can't get behind the notion of the military organisations in The Spiraling Worm ever achieving any noteworthy success against Mythos entities, let alone any individual personnel surviving multiple encounters without, at the very least, ending up straitjacketed in a sanatorium. 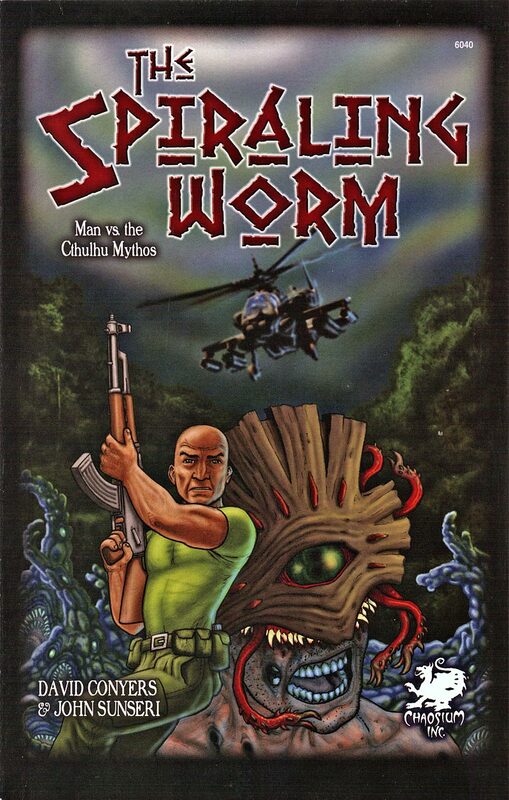 The Spiraling Worm stories are set in the present day, but if you reckon the King in Yellow is in any way impressed by nukes, chainguns and aircraft carriers, I would venture that you are mistaken. Alien races able to travel through time and/or between stars casually, on a whim, without even using a spaceship, couldn't defeat Elder Gods. But apparently a race that's only had aeroplanes for 100 years, and does not have a BPRD, has a real fighting chance. Oh, and don't read the blurb on the back of the The Spiraling Worm, because it gives away the climax of the main story. Right then, Negative Nelly. Book bad, do not buy. Got it. Buy what book instead? Well, at the end of The Spiraling Worm those strangely durable humans are all "yaaay, we're making an anti-Cthulhu Squad!" But Charles Stross already did modern-human-government-employees-versus-Cthulhu, much better, in his Laundry stories. The Atrocity Archives, The Jennifer Morgue and The Fuller Memorandum are the books; you can also read the stories Down on the Farm and Overtime for free online. Stross can do Cthulhu Mythos better than The Spiraling Worm when he's joking - see A Boy and his God. See also Neil Gaiman's A Study in Emerald, PDF here; Stross and Gaiman do a similar sort of gleeful dance through Lovecraft mash-ups that knock The Spiraling Worm into a cocked hat. Without an intrepid editor to bleach, slice and burn the bad bits out of The Spiraling Worm, though, it gets two stars out of five from me. One and a half, if you don't count the picture on the cover. Ah, the `pulled out of a story by bad grammar' problem. I had one recently, with `The Galileo Syndrome'. It's amazing how much longer reading a book will take because of silly stuff like that. You'd think that after more than a decade on the internet, I'd be immune, but no. I had planned on actually getting some work done this evening, but then I just had to go and read your blog post. Thanks to your copious links to some really, really great and interesting reading my productivity has dropped to something less than zero. A pox be upon you! In this case "discrete" isn't really spelled wrong, it's just the wrong damn word. I have a similar novel on my bookshelf: Planet One Drop by Starman Hopeton Gray. Yes, that is his name. The novel is all about how Big Brother - that is NASA by the way - is planning to take over the world. It is, um, quaint. I doubt spellcheck was used; however 'erbs', mon, might have been a crucial part of the creative process. I don't know Mr. Gray, I'm just taking a wild stab in the dark here. I have read it, once, and to be brutally honest it's rubbish (ludicrously silly conspiracy-theory UFOology rubbish, therefore highly recommended); I do love the book as 'Starman' did actually manage to get his Great Australian Science Fiction Novel published (which is one more than I have even started), and at least one sucker reader bought it - ME. I am hoping he turns out to be Australia's Tolstoy and this book is suddenly worth more than a house in Sydney, but I'm not holding my breath. I suspect he may well have got it published to win a bet. There is a whole series of novels by German fantasy author Wolfgang Hohlbein under the title of "Der Hexer von Salem" ("The Warlock of Salem") in which the Hero, whose father, the eponymous warlock, had a white streak of hair that he aquired that time he killed a Great Old One. In the first book, which was a compilation of previoulsly published dime novels, the new warlock (our hero) continues to live thorugh some adventures featuring an asortment of GOOs and other beings. Unnecessary to mention that a few of the GOOs he encounters don't survive making his aquaintance. Interestingly, the name "Shogoth" seems to be the only creature name from the mythos that stuck in the author's mind, since most of the, very diverse, creatures that feature in thos stories are supposed to be Shogoths. I can't believe you got through all that without mentioning Neil Gaiman's "Shoggoth's Old Peculiar". Audiobook version *strongly* recommended. Sometime I need to go to a performance by the Rl'yeh City Theatre Company, temporarily on the road here in my city. That type of writing is everywhere. I am not an English major by no means and have to think for a while to create a somewhat readable sentence and even I see the mistakes. Newspapers, magazines, even invitations to formal events. It is just becoming a very informal world.